As a college student from the United States, my time with Prague Youth Theatre has been filled with new and diverse experiences. I have encountered different forms of directing, acting, teaching methods, and have gained a lot of insight into the business side of a theatre. These new perspectives on theatre have helped me to grow in my knowledge of the business and art of theatre. Through my education in the United States, I have formed a foundation of knowledge on theatre and directing. However, I had not had the opportunity to apply this knowledge in a professional environment. Through PYT, I have been given this opportunity. I have been able to assist with the fall session productions as well as several of the London Academy of Music and Dramatic Arts (LAMDA) examinations. Through these rehearsal, I have observed different styles of directing as well as being able to give some of my own input into the productions. During my time with PYT, I have discovered some differences between what I have learned in the US and what is being practice at this theatre. At my university, actors are taught to never play an emotion. Instead, our actors are taught to play an objective, an action that will evoke the emotion within them. However, at PYT, the students are taught to use both an emotion and objective. This allows them to better understand the emotional state of their character. From what I have seen, I do not believe that either choice is better than the other. It is most important for the actor to understand what is happening within the scene. As a director, I think it is beneficial to be able to communicate what you want to either kind of actor. Therefore, it is important to understand the actor that you are working with and what helps push them to the height of their performance. Another difference that I have encountered is that PYT has developed a system of directing that includes as many students as possible. Not only is this an opportunity for the students, but it has also streamlined their rehearsal process. During the Tots, Juniors, and Seniors sessions, students from the Advanced group have the opportunity to learn more about directing. The students are able to act as assistant directors to these productions. 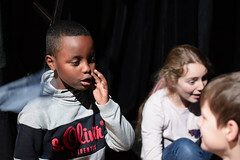 This opportunity provides the students with the chance to experience another form of creating theatre, as opposed to acting. It also allows the students to work on several different scenes all at once and creates a more efficient process that is very beneficial to a theatre that only has rehearsals once a week. In addition to learning new acting and directing techniques, I have learned a lot about the business side of PYT. As a directing student, I do not learn much about the marketing side of theatre. However, I have been exposed to a lot of this through my time with PYT. I have observed how PYT uses social media to promote their theatre and shows. They make daily posts that keep followers informed about what is happening at PYT. They also keep up with their contacts within the theatre business in order to keep those relationship positive and fresh. As theatre is a huge relationship business, this is very important. Gaining this knowledge about another aspect of theatre is something that I believe will be very beneficial to me in the future. My experience with PYT has been very educational. I have learned a lot about theatre as a whole as well as theatre in an environment that is different from what I am used to. I have been exposed to different directing techniques as well as different acting methods. These new discoveries have shown me how theatre can be done in many different ways. I have also seen how important marketing is to a theatre. Keeping a theatre relevant can make a big difference in its success or failure. When I return to the US, I hope to apply what I have learned at PYT to my future jobs.